Under the topic "The Value of Korean Traditional Sport in Youth Education," WTF President Chungwon Choue (at the podium) speaks during the Parallel G session on the third day of the 6th World Forum on Sport, Education and Culture at the BEXCO in Busan, Korea on Sept. 27, 2008. At the session, President Choue made a presentation on the WTF Taekwondo Peace Corps program. Taekwondo is an effective educational tool for young people around the world and now is the time for taekwondo to serve the world, says president of the world's taekwondo governing body. As part of efforts to promote global peace, the president says that he hopes the WTF-initiated Taekwondo Peace Corps program to be expanded into a new entity of the so-called Sport Peace Corps, in cooperation with the United Nations and the International Olympic Committee. "As proven by numerous studies, taekwondo training has significant educational effects on children in the stage of personality forming and emotional vulnerability," said Chungwon Choue, president of the World Taekwondo Federation. "It teaches youth about justice, morality, respect, cooperation, lover for one another, and to accept the universal sport rules of fair play." 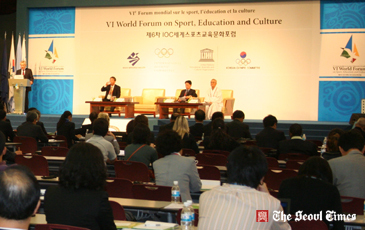 Under the topic "The Value of Korean Traditional Sport in Youth Education," WTF President Choue made the remarks in the Plenary G session of the 6th World Forum on Sport, Education and Culture at the BEXCO in Busan, Korea on Sept. 27, 2008. Dr. Choue's 20-minute presentation drew keen interest from the participants in the IOC forum. The three-day, IOC-promoted forum, which opened on Sept. 25 in a ceremony, drew more than 800 world sports leaders, including about 30 IOC members. The biennial event is organized by the metropolitan city of Busan. WTF President Choue said, "Through such learning, and mental and physical disciplining, it helps sound personal development and self-enhancement of the young." "This, in effect, could curtail them from getting involved in youth delinquency, drugs, alcohol and violence." "The educational value of taekwondo has been recognize by many countries outside Korea," he said. "Last year, the Sichuan and Hunan provinces in China adopted taekwondo as a required course in their elementary schools. Primary schools in the Boston area and Indonesia have introduced taekwondo as a mandatory curriculum. Canada's Chatham College International initiated a residential secondary-school taekwondo program." Taekwondo is not merely a sport, but encompasses excellent cultural values and spirits that cannot be learned from the textbooks, he said. "Sharing these excellent qualities of taekwondo with those who are deprived of the opportunity to learn and practice despite their wish is a noble act of the taekwondo people." Dr. Choue said that there are many people in the world who are deprived of the opportunity to learn and practice sports due to lack of necessary equipment, facilities, instructors, and program, he said. Some countries are desperate and eager to receive any kind of training equipment and uniforms, either new or used. "As part of its efforts to provide them with such necessities, the WTF has expanded its assistance in the form of in-kind contributions to countries in need among its 188 member nations around the world." WTF President Choue said. The WTF has also launched initiatives with other relevant organizations to send taekwondo equipment to the disadvantaged countries and to provide taekwondo training program for coaches and athletes from less developed countries. One ambitious project by the WTF is sending taekwondo instructors to countries in need of assistance to offer programmed physical and mental training to the local people, especially to the disadvantaged youth. In July this year, the WTF, together with GCS International, launched the Taekwondo Peace Corps project of dispatching volunteers from the taekwondo community who wish to share fundamental values and hope through taekwondo. This past summer, the WTF's first 27 Taekwondo Peace Corps members were selected and after a two-week training course, they were dispatched for one month to seven regions in five countries – Russia (Moscow), India (Bombay and Goa), Pakistan (Islamabad), Paraguay (Asuncion) and China (Qingdao and Urumqi). WTF President Choue said the 2008 Summer Taekwondo Peace Corps team were warmly welcomed and appreciated by the host countries. "The impressive turn-out at the training and enthusiasm certainly reflected the yearning of the local youth for an opportunity to learn and practice taekwondo. The Taekwondo Peace Corps presented children, among others, an opportunity and resources to enjoy and play and to share a vision of never-ending hope, optimism and confidence." Based on the experience of this pilot study, WTF President Choue said that the Taekwondo Peace Corps program will be expanded to a twice-a-year, short-term dispatch for two moths, and a long-term dispatch of instructors for six months to two years. "The project will not only be confined to Koreans or solely based in Korea. The establishment of the Taekwondo Peace Corps worldwide will be encouraged with its bases in as many countries as possible, and by incorporating qualified taekwondo instructors of different nationalities." he said. "The expansion will be founded on a close consultation with the WTF's 188 member national associations around the world." He continued to say, "The Taekwondo Peace Corps is just the beginning. Inspired by our experience, I proposed developing the Sport Peace Corps program to expand the initiative globally and to involve other sport-related organizations such as the IOC, U.N. institutions, as well as their network of relations with the sport-related institutions and sponsors." The Sport Peace Corps entails provision of comprehensive sport-related assistance to the underdeveloped countries or the U.N.-assigned areas, he said. "The assistance includes coaching and training service to the local young athletes, supply of equipment and facilities, and finding the means for the competent young people to partake in international sporting events." Dr. Choue concluded his presentation by saying, "Someday my vision of the Sport Peace Corps will be realized to further promote the Olympic ideal, and offer chances to youths from wider range of countries to partake in international sporting events, where they can showcase their athletic talent while enjoying the priceless educational experience." "I assure you that taekwondo will be at the forefront all the way in the course of realizing this vision of sharing love and hope with the world through sport."